The 37th edition of the annual CECAFA Cup gets underway on November 27th as East Africa’s national teams do battle in Kenya. A predecessor to this competition was first held under the name the Gossage Cup way back in 1926 but under its current guise the Kenyans have hosted on 5 occasions, most recently in 2009. Historically Africans weakest zone CECAFA are yet to produce a World Cup finalist and rarely offer a threat on the continental stage with their only African Cup of Nations triumphs coming courtesy of Ehtiopia and Sudan in 1962 and 1970 respectively. The hosts were beaten in the final by great rivals Uganda last year and both teams will be expecting to challenge for the cup this time around. Of CECAFA’s 12 members only Djibouti will not be in Kenya with Africa’s smallest non-island nation rejecting the invite for the second year running, being replaced by 2012 African champions Zambia. The tournament serves different purposes for each nation with some of the bigger sides using it as an experimental tournament and bridge between different qualification campaigns for both the World and African Nations Cup. For others it’s a rare opportunity to play as a national side with the obtaining of just a couple of points the aim. The capital Nairobi will host the final with Mombasa, Kisumu, Machakos and Mumias the other venues for the tournament. Below is a look at each competing team ahead of next week’s kick off. Group B: Tanzania, Zambia, Burundi and Somalia. Group C: Uganda, Rwanda, Sudan and Eritrea. Kenya – 2013 hosts and winners on 5 different occasions the Kenyan public will be expecting nothing less than a gold medal from their team which last qualified for an Afican Cup of Nations in 2004. Clifton Miheso and Mike Baraza impressed in an experimental and purely home-based side last time and they will be aiming to top group A ahead of Ethiopia. 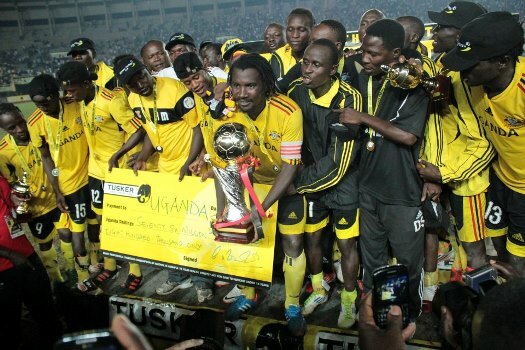 Uganda – Uganda enjoyed relative success under Scottish manager Bobby Williamson when they were hugely unlucky to not qualify for the last African Cup of Nations as well as winning the CECAFA Cup twice. Williamson left earlier this year and new coach Milutin Sredojević will be hoping for success in Kenya after losing 4 of his first 7 games. Tanzania – Champions at 3 of the last 6 tournaments Tanzania are improving steadily in African football. Danish manager Kim Poulsen guided the Tanzanians to the last 4 before an embarrassing loss to non-FIFA island rivals Zanzibar in last year’s bronze medal match. Mrisho Ngassa and John Bocco joint top scored last year and Tanzania should feature at the business end this time too. Sudan – It’s possible to view the Sudanese as underachievers having last won the CECAFA Cup 10 years ago. Former national team captain turned manager Mohamed Abdallah will be able to rely on dangerous Al-Hilal front pair Mudather El Tahir and Muhannad El Tahir to improve on Sudan’s embarrassing group stage exit last year despite a tough draw. Ethiopia – The Ethiopians offered CECAFA’s best challenge in the 2014 World Cup qualifiers going out to Nigeria in the play-offs but have not won this tournament since 2005. Despite the likelihood of a weakened squad after a long World Cup campaign they will still be expected to qualify from their group courtesy of their attractive style and could well feature at the latter stages this year. Zambia – After underwhelming performances in the 2014 World Cup qualifiers and 2013 African Cup of Nations the Zambians are currently in a transitional phase after the sensation of continental glory in 2012. Charismatic manager Hervé Renard is no longer in the dugout and the Chipolopolo will be using an inexperienced team to challenge Tanzania for top spot in group B.
Rwanda – Appointed earlier this year the 2013 CECAFA Cup will be largely a case of finding his feet for new manager Eric Nshimiyimana. Winners with a ‘B’ team in 2005 Rwanda have a young national side at the moment, some of whom were part of the youth team that sensationally qualified for the under-17 World Cup in 2011. Zanzibar – The island off Tanzania are not FIFA members but tend to add a lively contribution to the CECAFA Cup, which they won once in 1995. They surprisingly finished 3rd last year after losing their semi-final to Kenya. Khamis Mcha is a threat up front with seasoned Tanzania internationals Aggrey Morris and Nadir Haroub part of a solid Zanzibari defence. Burundi – Burundi have a poor record at the CECAFA Cup and have never won the trophy. After a 100% start in a tough group last year they lost out to Zanzibar in the last 8 and inconsistency often blights their campaigns. They will be hoping talismanic forward Selemani Ndikumana, who spent 2 years in Europe, can deliver the goals to get them out the group. Somalia – The war-torn nation have finished bottom of their group on the last 7 occasions winning 1 CECAFA Cup game out of their last 25. They conceded 13 in 3 games last year and defence often lets them down but they’re arguably the most likely of the underdogs to cause an upset in Kenya. Kuwait-based Mohammed Ali and captain Yasin Ali are key. Eritrea – Despite the last 3 Eritrean national teams to enter the CECAFA Cup vanishing and seeking asylum the Red Sea Camels will again be competing this year. Little is known of the generally skilled but wildly inexperienced national teams from Eritrea but they are capable of reaching the knockout stages, as demonstrated in quarter-final exits in 2007 and 2009. South Sudan – The world’s newest country and FIFA member South Sudan made their CECAFA Cup debut last year as they exited without embarrassment at the group stage despite failing to score a goal. Manager Zoran Đorđević will be hoping his side can pick up experience before their maiden African Cup of Nations qualification campaign next summer. This article was written by Ed Stubbs, his first for SFG. Ed is a sports writer and runs @NonFIFAfootball and the accompanying blog, nonfifafootball.blogspot.com. You can follow him on twitter @ed_stubbs1.